I liked the giant video thumbnails in Cosmic Panda. Pity they didn't introduce them. No more? 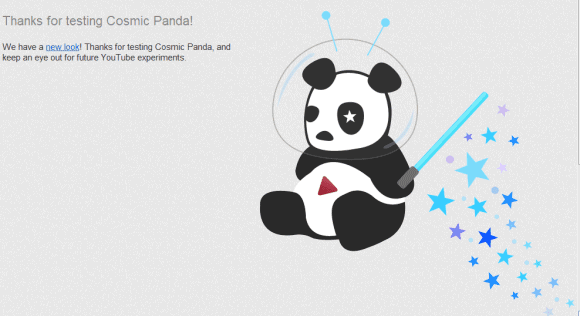 Cosmic Panda has been merged into the current interface of YouTube. Why is the new layout still being shown on some YouTube channels? If it's not Cosmic Panda, then they've merely changed the name because it's still in use! Complete BS. The exact same layout is still in use, and all channels will be forced to use the layout as of March 1st, 2012. You haven't tried Cosmic Panda when it was available. The current interface is based on Cosmic Panda, but there are many missing features.